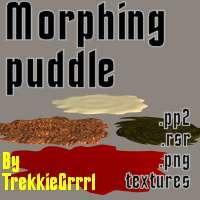 A puddle with several morphs and a few different textures. The perfect puddle, so very hard to find. Thank you! LaylaDragor (5 years ago) Inappropriate? I could kiss you for this, I've been all over the place looking for this very thing. Morteus (7 years ago) Inappropriate? Godsend - just what I needed! Fisty (7 years ago) Inappropriate? Very nice prop, thank you very much for making and sharing it.